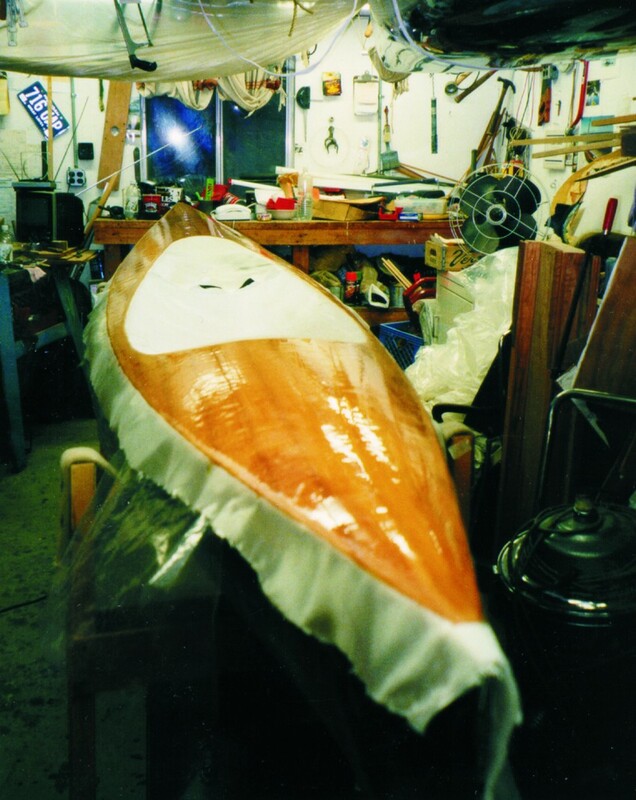 Using epoxy with wood and modern high modulus fibers,the homebuilder can create light and strong evolutions of the sailing canoes designed by the Scot, John McGregor,in the 1860’s. Modern decked sailing canoes are simple, efficient, solo craft which are equally proficient under sail or double-bladed paddle. Puffin and Serendipity,for example, are 15′ long with a 34″ beam. Their unrigged weight is 45 lb; fully rigged weight is under 70 lb, including mast and sails, paddles, seat,flotation bags and bailing gear. Easily loaded on top of a car, they open up a world of cruising possibilities. The Scotsman John MacGregor is generally credited with originating the sailing canoe. During the 1860’s, he had at least seven boats built to his specifications which he called Rob Roys. These were 13’—15′ long, 27″—29″ wide, and weighed between 60 lb — 80 lb. MacGregor sailed and paddled them on the rivers and canals of Europe, the Baltic, and the Jordan River in the Middle East. After each trip, he wrote a book which popularized the design and inspired many: “in walking you are bounded by every sea and river, and in a common sailing-boat you are bounded by every shallow and shore; whereas, …a canoe could be paddled or sailed, or hauled, or carried over land or water” (1000 Miles in the Rob Roy Canoe). The British Royal Canoe Club with MacGregor as its commodore was founded in 1866, the American Canoe Association in 1880. A notable early American cruise was that of ACA Secretary Charles Neide and retired sea captain “Barnacle” Kendallwho in 1883—1884 paddled and sailed over 3000 miles from Lake George, New York to Pensacola, Florida. However, in 1886 racing began to dominate when the ACA met the RCC for the 1st international regatta. Racing created the demand for pure sailing efficiency, and the paddling capabilities and versatility of the earlier sailing canoes began to fade. While this move to maximize speed and sail area eventually led to the International sailing canoe, it is the pre-1886 boats that are the direct ancestors of Puffin and Serendipity. Racing created the demand for pure sailing performance, resulting in some exotic rigs with lots of sail area. I tried to buy a new sailing canoe. Replicas of 19th century craft seemed impractical with either fragile or very heavy hulls, centerboards in the way, and, often, inefficient rigs. But I was hooked. If the old idea of a 50/50, half paddler and half sailer, could be updated…? I read, built and experimented. Mystic Seaport and the Adirondack Museum became temples. 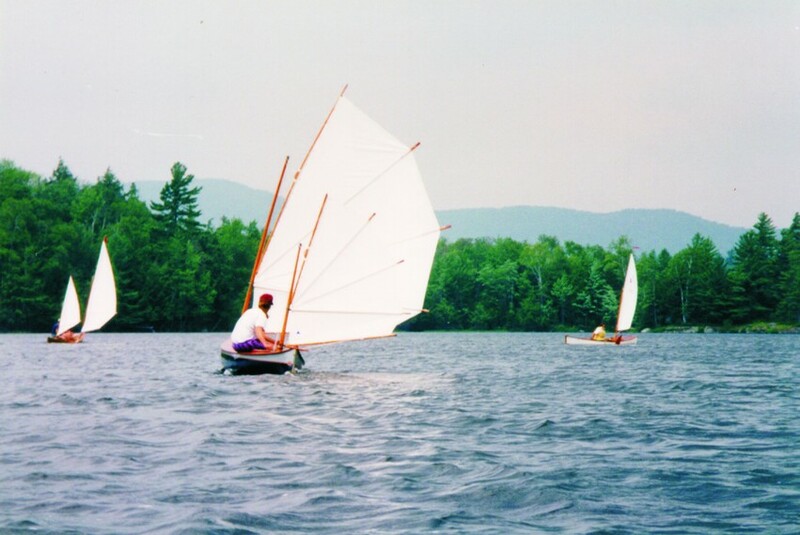 In the late 1980’s I tried many windward sail rigs on kayaks, Kleppers, and canoe hulls. With Ron Sell and Howard Rice, I made a pilgrimage to Bruce Mines, Ontario to see Yakabooin which Fritz Fenger had traveled from Barbados to Saba in the Caribbean in 1911. Her spars blew me away, obsolete or not. All boats are compromises. Through experience and research, I have tried to define the design constraints of the sailing canoe. Balancing the requirements of its dual propulsion of sailing and paddling forces particular compromises. You have to balance such things as strength and ruggedness enough to drag loaded over a rocky beach with light weight for efficiency and easy car topping. Although the design requirements seem simple, they must be respected: not too long, not too short; not too wide, not too thin; not heavy, but not weak. Length Too much length makes too much drag from extra wetted surface. Human paddlers can only develop so much power. So if a boat is too long for the power you make, you’re just dragging around extra wetted surface all the time, slowing you down, tiring you out, making you spend more money and energy for too big a boat which you can’t use efficiently or control as well. Beam A cruising sailing canoe needs enough beam for sailing power. But too much beam hinders paddling. It needs enough displacement to be useful for traveling, carrying paddler and gear, including food and sufficient water. Although this is a minimalist’s game, you can carry more than a few dried noodles and quart or two of water. But too much displacement is more drag. Once again, you need to compromise. Directional stability With a double paddle and practice, a reasonably competent paddler can make a coracle or beach ball go where he or she wants. So train-like tracking is not particularly important and is counter to good sailing control. You need lots of rocker for sailing and rough water paddling. Rocker lets the boat pivot over its buoyancy and turn easily. Cockpit shape Safety and comfort help determine cockpit shape. Sufficient cockpit length makes it possible to carry a passenger in an emergency, an important safety consideration. The old wider cockpits allow you to develop sailing power to weather and still stay in the boat, a crucial consideration for safe, comfortable travel. Using more flowing and organic shapes with wider, rounded rims to better deflect waves is also easier on aging flesh and bones. Comfort To be comfortable, a boat must fit you. As John McGregor said in 1868, “the one great principle [is] far too often forgotten, that a comfortable boat, like a shoe, or a coat, must be made for the wearer, and not worn down to his shape.” Molded, adjustable, and moveable seats inspired by automotive design can combine day long comfort with the differing requirements for paddling and sailing. 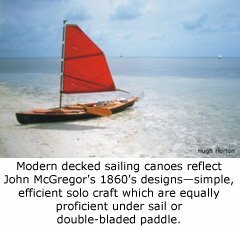 Modern decked sailing canoes reflect John McGregor’s 1860’s designs-simple, efficient solo craft which are equally proficient under sail or double-bladed paddle. My design requirements were for a boat that’s not too long for a modest wetted surface, but long enough to match the power a paddler develops; that’s wide enough for stability, but not too wide for paddling; and that has enough rocker, looking to many canoeists like a whitewater boat. For Puffin and Serendipity, I chose the best proprietary hull as I saw it, Bell Canoe’s “Starfire”. Designed by Dave Yost, it is 15′ long, 34″ wide. Decked only hulls weigh under 45 lb. Rigged hulls weigh between 70—75 lb. The Bell “Starfire” is a champion, freestyle competition tandem/double, meant for medium-sized paddlers. It has a good shape in a light, very well built hull. The hull lay up is 2/3 carbon and 1/3 Kevlar. Although our hulls are top of the line carbon and Kevlar ™ Bells, a homebuilder could make a similar stripper or stitched plywood hull. The first modification I make to the “Starfire” hull for cruising is building the deck. Since the hull has pinched shoulders and pronounced tumblehome for freestyle paddlers, I cut the sheer down, low enough for comfortable paddling with a double paddle, but high enough for buoyancy. I keep the ends as high as I can consistent with a fair mid sheer at the determined sheer heights. The fore and aft deck centerline profile is a shallow curve, lower amidships than the stems, much like the deck profile on 19th century boats. The thwartship deck profile is an arc for maximum volume and easy water shedding. Although I’ve built male molds and build decks directly onto hulls, Serendipity’s deck was strip planked into a female mold to control fairness better. I applied a layer of Kevlar and finished the underside while the deck was still on the mold. Before joining the deck to the hull, I complete the interior hull work, such as installing bracing and reinforcing for the bow and stern lifting U-bolts, and installing the rudder gudgeons using WEST SYSTEM ® epoxy thickened with 406 Colloidal Silica filler. Then I trimmed the deck roughly to fit, placed the hull on it, and bonded them together with a bead of epoxy thickened with 403 Filler. After gluing, I can easily fair the top with some certainty that the shape will remain fair. After the deck is faired, I apply a layer of S-glass and build up coats of epoxy. I finish the exterior deck/hull joint by covering it with a layer of braided Kevlar tape. On the inside, I fair the joint with a small fillet and cover it with Kevlar tape as well. I built the deck in a female mold to better control fairness in the finished deck. I applied a layer of kevlar and finished the underside before removing it from the mold. My emphasis in building has been to find the best material for the job consistent with use by the homebuilder. I’ve used a variety of woods throughout, including ash, sugar pine, Spanish cedar, and western red cedar. Other woods with similar properties could be substituted. Sometimes wood is used in its most elemental form, such as in the seat thwart, or saturated with an oil finish in the steering rods. Other times wood is only the core material in a composite with glass, carbon and/or Kevlar. Wood functions as the web in a beam or simply holds fibers in position and provides flotation. Sugar pine is a light, soft, flexible, pattern makers wood with great stability and ease of working. Since my family owned a lumberyard supplying the southeast Michigan pattern industry, I have, use, and love sugar pine. It makes fair, easily worked strip planks for either hulls or decks. It’s good for seats, particularly since strength is added with carbon or Kevlar fibers. I’ve also made steering rods of sugar pine, although they might be slightly better if they were Sitka spruce, a much stiffer wood; however, then they would be more susceptible to accidental damage. Douglas fir, red pine, hickory or nearly any straight grain wood could be alternatives. Westernred cedar was my pick for spars for the gunter rig because of its extreme lightness. Its long, straight grain is perfect, and it is readily available as clear boards for home decks or deck railings. My gunter spars of hollow red cedar reinforced with carbon are lighter than an all carbon mast. Any fairly straight grain, light wood could have been substituted. I also used red cedar to carve a pattern for a seat thwart, then made a teak thwart, but have been using the cedar one, bare, with no finish at all, ever since. My decks are Spanish cedar. Very light, Spanish cedar was the wood of choice for racing canoes and rowing shells of the 1800’s and early 1900’s. It has attractive, variegated grain, so is fine for strip planking when used with glass, Kevlar, or carbon fibers. To many people, its appearance varnished resembles varnished teak. It is also very rot and critter resistant. Its grain structure, however, is somewhat unsuitable for spars, particularly if not carbon reinforced. Ash was used in the rudder yoke and stock because of its stability, strength, hardness, and splitting resistance. Teak, cherry, mahogany and others could have been substituted. WEST SYSTEM epoxy’s ability to bond to a variety of materials allows one a broad choice of natural and manufactured materials and their combinations to meet particular design requirements. 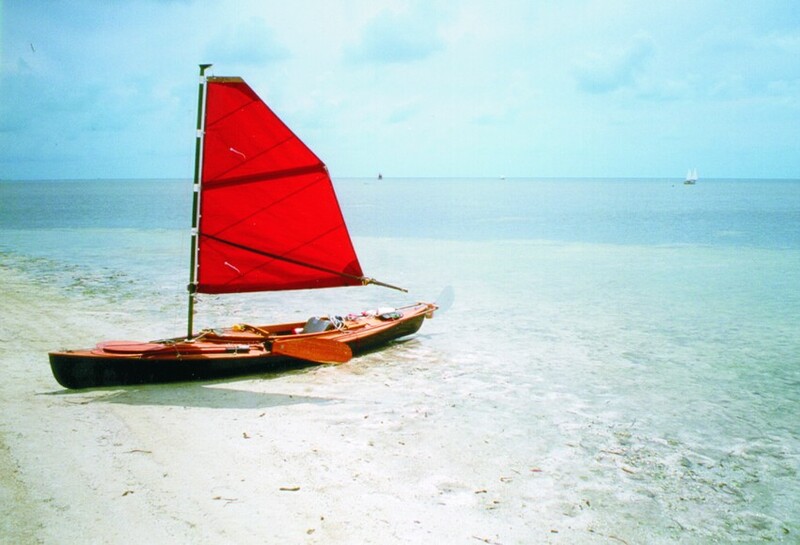 Epoxy’s ease of use and ability to combine materials into a light, strong, low maintenance structure make this evolution of the traditional sailing canoe possible. Orientation is critical when working with manufactured fibers to realize their engineering strength. Composites do not have uniform strength in every direction like steel or aluminum. Aligning loads with fiber orientation is critical. After gluing, i can easily fair the top with some certainty that the shape will remain fair. Then i apply S-glass. Carbon fiber is immensely strong in both tension and compression so I use it for maximum strength. It’s easy to abrade and easy to shape compared to Kevlar. However, its fibers are noxious and its sharp ends can be worse than glass, its black color can cause detrimental heat buildup, and its dust is both irritating and noxious. So I prefer carbon to be well coated with epoxy and painted or covered with Kevlar. Carbon cloth is used in the hulls, and I use it in the leeboard bracket and the seat. I also use individual carbon tows laid in grooves lengthwise to stiffen the hollow wooden spars of the gunter rig. Kevlar has tensile strength, but it is relatively weak in compression. It has astonishing abrasion resistance, making it hard to work. Unlike carbon, it is pleasant to our skin, even as raw fibers. Where I can build up sufficient thickness to overcome Kevlar’s weakness in compression, I favor Kevlar for parts that are likely to be touched and rubbed frequently. The Kevlar braid for the cockpit coaming and tape around the sheer are good examples. The cockpit coaming is an example of evolved construction techniques. 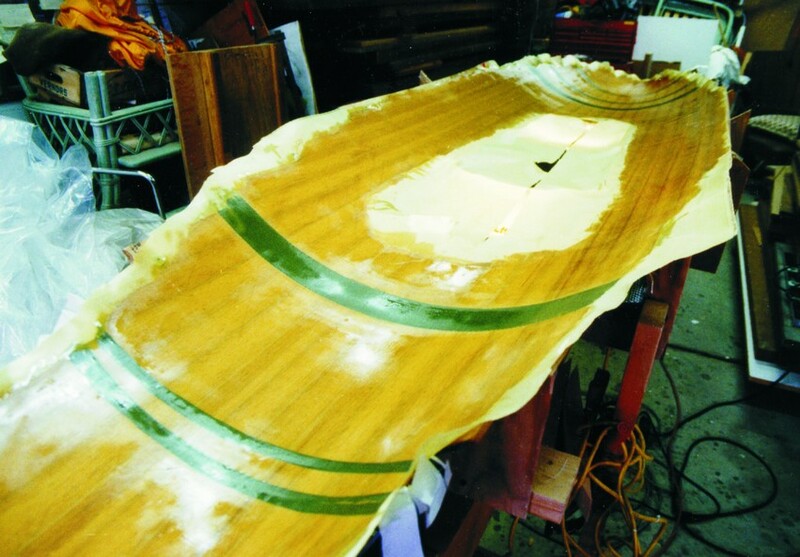 The coaming and rim can be installed either before or after the deck is attached to the hull. I first used simpler all wood coamings and rims, then experimented with more complex shapes and composites of wood, Kevlar and carbon. I now use solid Kevlar, molding Kevlar braid on the boat as shown in the following article. The results are strong, pleasing to the touch, effectively shaped, and attractive. Because we can paddle when the wind is light or in the wrong direction, we don’t need big, light-air sails. In stronger winds, the problem becomes too much sail area. In these little boats, going too fast can become a problem soon and often. It’s important to be able to reduce the size of the sail easily and in rough conditions. Even more important is being able to get it down completely and stowed. The gunter rig I’ve developed is light, simple and seaworthy. However, it still reefs slowly, and the upper sail shape is not what modern aerodynamics tells us is most efficient. Meade Gougeon has been experimenting with a new mast and sail configuration for the sailing canoe. His double reefing rig reduces sail fast and has superb shape. But it is heavier, and, with separate parts, more complex and trickier to strike from the seat. We’ve been calling these boats “50/50s” because they are equally capable under sail or under paddle. But they are better than half good sailers or half good paddlers. Although a compromise, they do each activity well. 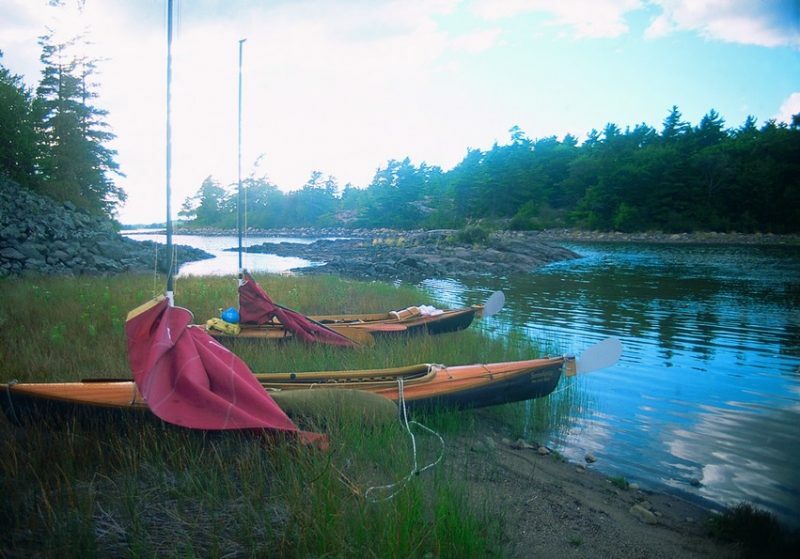 You can paddle a marsh or sail between islands, slip in close to camp on a deserted shoreline or venture out to sea. A good cruising canoe is a virtual magic carpet with sailing the warp, paddling the weft. If you enjoy simply messing about in boats or want a new boatbuilding project, consider an elegant and efficient 21st century evolution of the historic sailing canoe.